We try to achieve thermal comfort subconsciously every day. One of the main purposes of buildings is to protect us from extreme outdoor conditions. Thermal comfort is taken for granted by most people, but energy is used to obtain it, through heating or cooling for example. When designing buildings it is important to consider thermal comfort; designs should provide good thermal conditions based on energy-efficient technologies like natural ventilation, solar shading and intelligent building design. Thermal comfort can be defined as “that condition of mind which expresses satisfaction with the thermal environment” (CEN, 2005). Thermal comfort is more than just pleasant conditions; it is part of a vital survival behaviour. Whenever people feel too warm or too cold, a warning system is alerted by our body-controlled basic instincts. The human body is a very efficient piece of machinery and is able to maintain core temperature within a very narrow range of 37°C. Some actions are subconscious, like diverting blood from decentralised areas like hands and feet to keep the vital organs warm in cold environments or to start sweating in warm environments. Conscious actions include removing or adding clothes and adapting our activity level. But whichever way you look at it, the right thermal conditions are needed to survive (Baker, 2009). And if the thermal environment does not meet expectations, occupants of a building will try to influence the thermal environment to make it do so by installinglocal electric heating or cooling units; equipment using additional energy that could have been avoided if the building had been designed with thermal comfort in mind from the beginning. Many people associate thermal comfort directly with air temperature, but this is not the whole truth, as the temperature subjectively experienced in a room is acombination of several parameters. Arguably, the most important parameter is people’s different expectations of thermal comfort. So it can only be calculated for the average human being and the individual experience is vital. Thermal comfort depends on other parameters than air temperature alone, such as activity, clothing and individual preferences of the occupants. Thermal discomfort occurs when the thermal environment does not meet the requirements of the human mind or body. In cold environments, we feel cold and our hands and feet drop in temperature; we get goose bumps and even start to shiver, in extreme cases resulting in hypothermia. At the other extreme, in warm environments perspiration will start, possibly leading to hyperthermia in extreme cases. All of these responses are reactions to non-comfortable environments. Below are some examples of specific discomfort cases. The sensation of draught depends on air temperature, air movement and air turbulence. The human body is not able to sense the actual air movements at low velocity, but it can feel the increased cooling of the skin, which is caused by the air movements. If not adequately maintained VELUX roof windows can be a source of draught. Older roof windows with a damaged gasket can be leaky and let cold air into a room in winter. So frequent maintenance is needed to keep the window in a good condition. Old and large panes may cause downdraught from the windows, where a cold inside pane temperature cools the air and causes a downward air movement. New low energy panes minimise the risk of draught. ​Figure 3.1.1 Person exposed to uncomfortable air motion. In winter, when the inside pane temperature is very cold due to the higher heat loss compared to the walls. But, as with draught, new windows will rarely cause problems. An internal blind or external shutter or awning blind can reduce or eliminate the risk. And in summer, when occupants are exposed to direct sun, solar shading can be used to eliminate thermal discomfort by blocking direct solar radiation. ​Figure 3.1.2 Person exposed to one cold and one warm surface. In most cases, thermal discomfort can be reduced by user behaviour, such as closing a window, moving to a different position in the room or putting on more clothes. Many experiments have been made to find out what has an influence on our sensation of the thermal environment (Fanger, 1970). The results of these experiments are the basis for the standard ISO 7730 (ISO 2005). Ergonomics of the thermal environment (CEN, 2005). 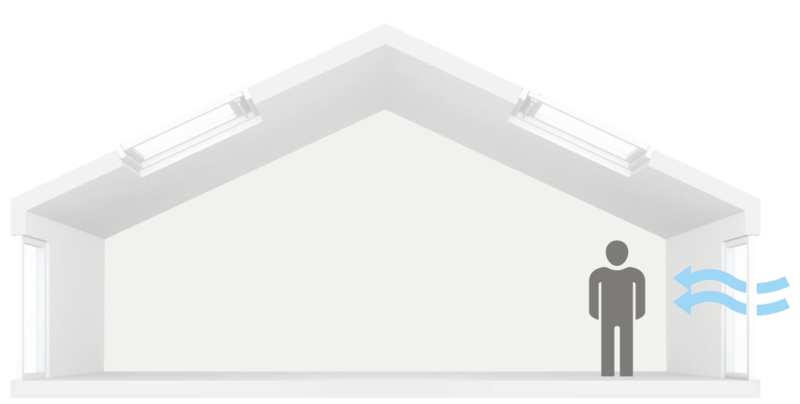 Of the six parameters, four are influenced by windows and their accessories – and hence by VELUX products. Air velocity and relative humidity are influenced by the use of the windows for ventilation; both the ventilation flap and normal opening play a role. Air temperature and radiant temperature are influenced by the heat transfer and sunlight through the window and by the use of accessories such as blinds and shutters. But there is a seventh parameter that is also important – the human mind. Individual expectations have been shown to have an influence on the acceptance of thermal comfort. 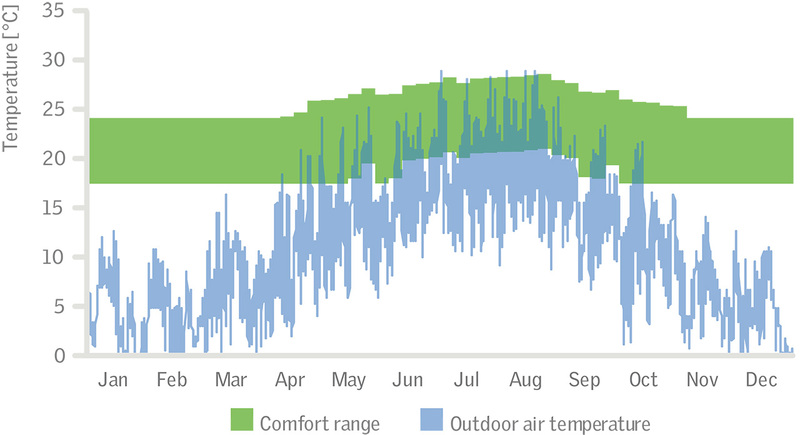 In warm climates especially, occupant expectations have been shown to influence comfort ranges. People are all different and want different thermal environments. EN ISO 7730 (ISO, 2005) is based on climate chamber studies. They show that people basically have the same thermal preferences, regardless of where they live on earth (de Dear et al., 1997). This philosophy for evaluation of thermal comfort is based on the assumption that neutral is the optimal status for thermal comfort. However, a constant temperature without variation during the day may not be what humans really prefer. Studies show that we tend to prefer variations in temperature, and that changes in around the neutral temperature is experienced as pleasurable. (de Dear, 2006). As human beings, we may in fact want variations in our thermal environment; we have a need for sensory and physical stimulation. One way to achieve is with fluctuating interior temperatures to counteract “thermal boredom” (McIntyre, 1980; Kwok, 2000). Heschong (Heschong, 1979), argues for environments with physical variations rather than static conditions, describing comfort as a relationship between thermal contentment and human imagination. We as humans are capable of recognising, remembering, and adapting ourselves to most thermal experiences. At the same time, field studies show that people working in naturally ventilated office buildings in warm climates accept higher temperatures (de Dear and Brager, 1998). The standard EN 15251 (CEN, 2007) provides limits for acceptable indoor temperatures for naturally ventilated buildings. These temperature levels assume that people can freely adapt their clothing and operate windows. Based on the outdoor 'running mean' temperature during the previous week, acceptable indoor temperatures are found in Figure 3.1.3. A running mean is a weighted average of a time period where the latest time periods has the greatest weight. In residential buildings, it can be assumed that the occupants will adapt their clothing to obtain comfort and in buildings with VELUX roof windows they will operate the windows, which were the assumptions for using the adaptation method. The consequence of adaptation is that thermal comfort can be achieved in warm climates, without air conditioning, by using natural ventilation, solar shading and intelligent building design. This allows significant reductions in energy use (see section 5.6.5). ​Figure 3.1.3 The figure shows the comfort range for Denmark. Calculation is based on the principles of adaptation of EN 15251 (CEN, 2007). Baker N. (2009), Daylight inside and the world outside, Daylight and Architecture, vol. 11.
de Dear R., Brager, G. S.,Cooper, D. (1997) Developing an Adaptive Model of Thermal Comfort and Preference – RP 884, ASHRAE. de Dear, R., Brager, G. S. (1998) Developing an Adaptive Model of Thermal Comfort and Preference, ASHRAE Transactions, vol. 104, no. 1. Fanger, P. O. (1970) Thermal comfort, Danish Technical Press. Heschong, L. (1979) Thermal delight in architecture. The MIT Press. McIntyre, D. A. (1980) Indoor Climate. Applied Science Publishers.